Since the late 1950s, Llyn Foulkes has produced richly textured works that incorporate collage, drawing, text, and found materials. 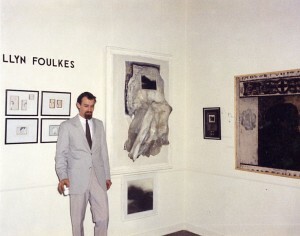 In the two-part assemblage Flanders, one of 92 works included in Foulkes’s solo exhibition at the Pasadena Art Museum in 1962, an amorphous mass of melted plastic tarp lurches from the picture plane into the space of the viewer. Refusing to settle comfortably within the categories of painting or sculpture, Flanders is typical of Foulkes’s engagement with the precariousness of picture making as a physical undertaking and as a representational proposition. 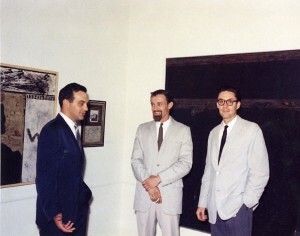 It relates to the abstract-expressionist influence of Richards Ruben, one of Foulkes’s teachers at Chouinard Art Institute, as well as to the Beat aesthetic of assemblage and the dark preoccupations of surrealism.